Enclosed with innumerous super nutrients and health benefits, tomato is a wonderfully popular, versatile food that comes in over a thousand different varieties that vary in shape, size and color. Although tomatoes are fruits in a botanical sense, they don't have the dessert quality sweetness of other fruits. Instead they have a subtle sweetness that is complemented by a slightly bitter and acidic taste. Tomatoes are now available year-round, the truly wonderful qualities of tomatoes are the best when they are in season from July through September. The glycemic index of tomato is 15 which falls under low category. Is Tomato safe for Diabetics? Including 3 to 5 servings of vegetables is a must in a diabetic menu. Carbohydrates plays a major role in impacting your blood sugar levels. Thus it is very important to decide the type and amount of carbohydrates in a meal and your whole day’s diet cautiously. Since tomatoes is very low in carbohydrates (5.6 grams of CHO in 1 cup of sliced tomato), the glycemic load of tomato is estimated to be around 1. It also has 2.6 grams of fiber in 1 cup of sliced tomatoes which will add on to the slow absorption of nutrients and thus keeping your blood sugar levels under control. 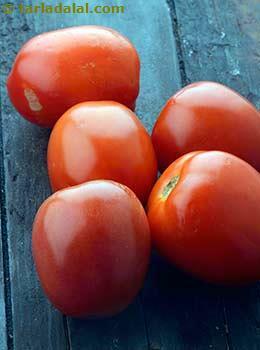 Tomatoes provides lycopene- an antioxidant which helps in reducing cardiovascular disease risk. It is a good source of vitamin A which helps in improving your vision. Is Tomato suitable for Weight Loss? Diet is a very critical component, when you are trying to lose weight. It is important to include fruits and vegetables low in calories over food loaded with saturated fats and simple sugars to reach your goals for weight loss. 1 cup of sliced tomato provides you only around 31 calories and safe for weight loss. Tomatoes have 80 % of water, fair amount of fiber (2.6 g) and other beneficial nutrients which keeps you satiated for a longer period of time without having to consume high calorie food. Tomatoes are almost devoid of fats. Exercise plays a crucial part in burning your calories, but ultimately you have to replace your high calorie food by low ones such as tomatoes to reduce the overall intake of calories in a day. Use tomatoes in your salads with sprouts and other vegetables, add it to your raita or simply have a bowl full of tomatoes. It is advisable to have certain vegetables in its raw form than cooked so that there is no nutrient loss.